Whether you are elderly, disabled, or recovering from an injury, you may have trouble climbing stairs comfortably and safely. If you, or someone you know, complains that it is difficult to lift feet or legs, especially when climbing steps, considering purchasing steps for the home. These steps can be added to a high doorway entrance or outdoor stairs that are too high to climb easily. By installing extra steps, the effort of lifting feet and legs can be reduced considerably. If there is one place everyone deserves to feel safe and comfortable, it is in their own home. Consider adding additional steps to make walking around the porch and house easier than ever. Most single steps come with rubber mats on the top and bottom to secure the feet and prevent slipping. They are also weatherproof, so there is no need to bring them if it starts to rain. They also contain drainage holes to keep moisture from gathering on top and causing slips and falls. Many models are wider than average steps, which allows the climber to balance more easily and confidently. 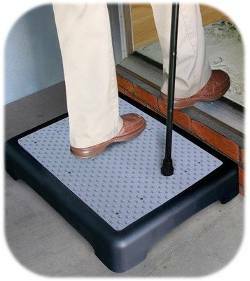 They are sturdy, rust resistant, and easy to install, making them a must-have for those who have difficulty climbing steps and stairs. Outdoor stairs do not have to be kept in the same place. You can carry them in your car for easy entry into tall vehicles such as trucks and SUVs. They can also be packed easily and brought on vacation, making hotel rooms and restaurants instantly more accessible for those who worry about tripping and falling. Outdoor steps come with risers as well, so if the step is not high enough, you can add height easily and with no difficult installation. It is as simple as stacking the steps on top of one another. Best of all, outdoor steps are affordable, so you do not need to spend a fortune making your home more comfortable. Outdoor steps usually cost less than $40, depending on the model. Recommended Outdoor Steps – These steps are great for the front door, entrance to the home from the garage, around the bathtub curb, and on indoor entrances with a higher step. Though made for the outdoors, outdoor stairs can also be used in and around the home to make access to certain areas easier. Place the steps in the bathroom so getting in and out of the tub or shower is safer and easier. Put them in the kitchen so there is no need to use an unstable step stool to reach cookware. Put them in the garage to reach items stored higher than arm level. Place one in the bedroom along with bed rails to make climbing onto a tall bed a breeze.